Gatwiri, Kathomi 2019. African Womanhood and Incontinent Bodies. p. 157. Lasselin, Julie Lekander, Mats Paues-Göranson, Sofie Olsson, Mats J and Axelsson, John 2018. Communication of health in experimentally sick men and women: A pilot study. Psychoneuroendocrinology, Vol. 87, Issue. , p. 188. Lee, Joshua Y Ready, Emily A Davis, Eric N and Doyle, Philip C 2017. Purposefulness as a critical factor in functioning, disability and health. Clinical Rehabilitation, Vol. 31, Issue. 8, p. 1005. Caruso, Rosangela Nanni, Mara Giulia Riba, Michelle B. Sabato, Silvana and Grassi, Luigi 2017. The burden of psychosocial morbidity related to cancer: patient and family issues. International Review of Psychiatry, Vol. 29, Issue. 5, p. 389. Hamilton, Clayon B. Wong, Ming-Kin Gignac, Monique A.M. Davis, Aileen M. and Chesworth, Bert M. 2017. Validated Measures of Illness Perception and Behavior in People with Knee Pain and Knee Osteoarthritis: A Scoping Review. Pain Practice, Vol. 17, Issue. 1, p. 99. Sirdifield, Coral Chipchase, Susan Y. Owen, Sara and Siriwardena, Aloysius Niroshan 2017. A Systematic Review and Meta-Synthesis of Patients’ Experiences and Perceptions of Seeking and Using Benzodiazepines and Z-Drugs: Towards Safer Prescribing. The Patient - Patient-Centered Outcomes Research, Vol. 10, Issue. 1, p. 1. Hanson, Bjorn and Young, Michael A. 2017. Understanding the Impairment Associated With Depressive Symptoms. The Journal of Nervous and Mental Disease, Vol. 205, Issue. 8, p. 600. Wise, Thomas N. 2016. A Prescient View of Palliative Care by the Psychiatric Physician. Psychiatry, Vol. 79, Issue. 3, p. 233. Keval, Harshad 2016. Health, Ethnicity and Diabetes. p. 1. Ong, Peck-Hoon and Koh, Gerald Choon-Huat 2016. Caregiver Factors in Stroke: Are They the Missing Piece of the Puzzle?. Archives of Physical Medicine and Rehabilitation, Vol. 97, Issue. 8, p. 1223. Prior, Kirsty N. and Bond, Malcolm J. 2014. Construct validity and temporal stability of the abridged 31-item Illness Behaviour Questionnaire. Psychology & Health, Vol. 29, Issue. 5, p. 517. 2014. Forensic Psychiatry. p. 801. Grassi, Luigi Caruso, Rosangela and Nanni, Maria Giulia 2013. Somatization and somatic symptom presentation in cancer: A neglected area. International Review of Psychiatry, Vol. 25, Issue. 1, p. 41. Moore, Andrew Grime, Janet Campbell, Paul and Richardson, Jane 2013. Troubling stoicism: Sociocultural influences and applications to health and illness behaviour. Health: An Interdisciplinary Journal for the Social Study of Health, Illness and Medicine, Vol. 17, Issue. 2, p. 159. Prior, Kirsty N. and Bond, Malcolm J. 2013. 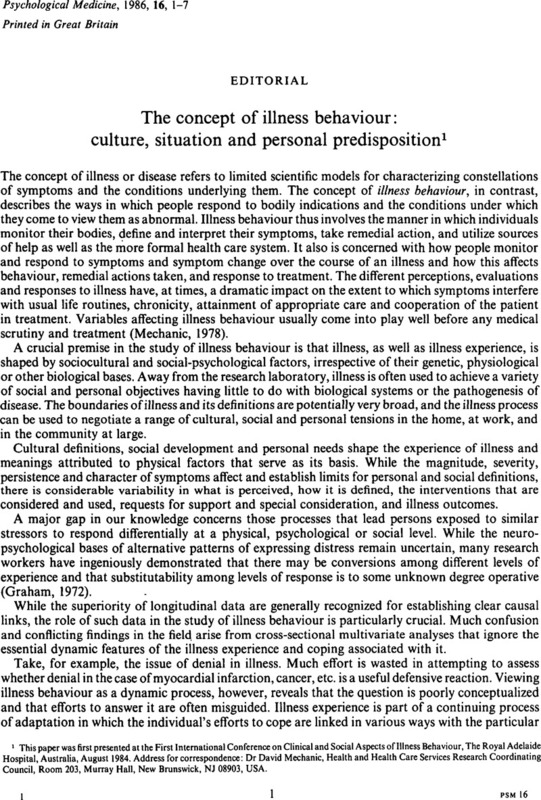 Somatic symptom disorders and illness behaviour: Current perspectives. International Review of Psychiatry, Vol. 25, Issue. 1, p. 5. Hardy, P. 2012. Manuel de psychiatrie. p. 345. Kao, Yu-Chen Liu, Yia-Ping Chou, Ming-Kuen and Cheng, Tsung-Hsing 2012. Psychometric properties of the Taiwanese version of the Illness Concept Scale: relation of health beliefs to psychopathology and medication compliance. Social Psychiatry and Psychiatric Epidemiology, Vol. 47, Issue. 4, p. 597. Hanson, Bjorn and Young, Michael A. 2012. Why Depressive Symptoms Cause Distress: The Clients’ Perspective. Journal of Clinical Psychology, Vol. 68, Issue. 7, p. 860. Nauenberg, Eric Laporte, Audrey and Shen, Leilei 2011. Social capital, community size and utilization of health services: A lagged analysis. Health Policy, Vol. 103, Issue. 1, p. 38. Unger-Saldaña, Karla and Infante-Castañeda, Claudia B. 2011. Breast cancer delay: A grounded model of help-seeking behaviour. Social Science & Medicine, Vol. 72, Issue. 7, p. 1096. Balint, M. (1957). The Doctor, His Patient and the Illness. International Universities Press: New York. Beecher, H. K. (1959). Measurement of Subjective Responses: Quantitative Effects of Drugs. Oxford University Press: New York. Cole, S. & Lejeune, R. (1972). Illness and the legitimation of failure. American Sociological Review 37, 347–356. Davis, F. (1963). Passage Through Crisis. Polio Victims and Their Families. Bobbs-Merrill Co.: Indianapolis. Dohrenwend, B. S. & Dohrenwend, B. P. (eds.) (1974). Stressful Life Events: Their Nature and Effects. Wiley Interscience: New York. Dohrenwend, B. S. & Dohrenwend, B. P. (eds.) (1981). Stressful Life Events and Their Contexts. Rutgers University Press: New Brunswick, NJ. Dubos, R. (1959). Mirage of Health. Utopias, Progress, and Biological Change. Harper and Bros: New York. Epstein, S. (1979). The stability of behavior. I: On predicting most of the people much of the time. Journal of Personality and Social Psychiatry 37, 1097–1126. Graham, D. T. (1967). Health, disease, and the mind–body problem: linguistic parallelism. Psychosomatic Medicine 29, 52–71. Graham, D. T. (1972). Psychosomatic medicine. In Handbook of Psychophysiology(ed. Greenfield, N. S. and Sternbach, R. A. ), pp. 839–924. Holt, Rinehart and Winston. New York. Greenley, J. R. & Mechanic, D. (1976). Social selection in seeking help for psychological problems. Journal of Health and Social Behaviour 17, 249–262. Harwood, A. (ed.) (1981). Ethnicity and Medical Care. Harvard University Press: Cambridge, Mass. Imboden, J. B., Canter, A. & Cluff, L. (1961). Symptomatic recovery from medical disorders. Journal of the American Medical Association 178, 1182–1184. Janis, I. L. (1951). Air War and Emotional Stress: Psychological Studies of Bombing and Civilian Defense. McGraw-Hill: New York. Kadushin, C. (1966). The friends and supporters of psychotherapy: on social circles in urban life. American Sociological Review 31, 786–802. Kadushin, C. (1969). Why People Go to Psychiatrists. Atherton: New York. Leventhal, H., Meyer, D. & Nerenz, D. (1980). The common-sense representation of illness danger. In Medical Psychology, Vol. 2 (ed. Rachman, D.), pp. 7–30. Pergamon: New York. Leventhal, H., Prohaska, T. H. & Hirschman, R. S. (1986). Preventive health behavior across the life-span. In Preventing Health Risk Behaviors and Promoting Coping with Illness, Vol. 8 (ed. Rosen, J. C. and Solomon, L. J.). University of New England: Hanover N. H. (in the press). Mechanic, D. (1970). Some problems in developing a social psychology of adaptation to stress. In Social and Psychological Factors in Stress (ed. McGrath, J. E.), pp. 104–123. Holt, Rinehart and Winston: New York. Mechanic, D. (1972). Social psychologic factors affecting the presentation of bodily complaints. New England Journal of Medicine 286, 1132–1139. Mechanic, D. (1978). Medical Sociology (second edn). Free Press: New York. Mechanic, D. (1979). Development of psychological distress among young adults. Archives of General Psychiatry 36, 1233–1239. Mechanic, D. (1980). The experience and reporting of common physical complaints. Journal of Health and Social Behaviour 21, 146–155. Mechanic, D. (1983). Adolescent health and illness behaviour: hypotheses for the study of distress in youth. Journal of Human Stress 9, 4–13. Mechanic, D. & Hansell, S. (1983). Adolescent introspectiveness, psychological distress, and physical symptoms. Presented at the 78th Annual Meeting of the American Sociological Association, Detroit September. Melzack, R. (1973). The Puzzle of Pain: Revolution in Theory and Treatment. Basic Books: New York. Nisbett, R. N. & Wilson, T. D. (1970). Telling more than we can know: verbal reports of mental processes. Psychological Review 84, 231–259. Veith, I. (1970). Hysteria: The History of a Disease. University of Chicago Press: Chicago. White, K. L. (1970). Evaluation of medical education and health care. In Community Medicine: Teaching, Research, and Health Care (ed. Lathem, W. and Newbery, A. ), pp. 241–270. Appleton-Century- Crofts: New York. White, K. L., Williams, T. F. & Greenberg, B. G. (1961). The ecology of medical care. New England Journal of Medicine 265, 885–892.